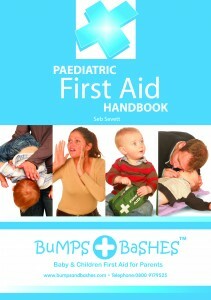 Bumps and Bashes Children & Baby First Aid Course for your own family. Now you are here, you are doing the right thing. You’ll receive all the extras: First Aid Book, Memory Jogger, FREE refresher course etc. Hello, welcome to my site, it’s a pleasure to have you on here. Rest assured I’m Fully Qualified Instructor & Assessor and have been specialising in teaching parents & grandparents since 2009. In this course, you will learn life-saving emergency first aid for every member of your family,(Adult emergency first aid is included) with the emphasis being on babies & children, covering major and minor injuries and accidents. Realistically delivered First Aid in our modern world! You will gain the confidence and learn skills that may save a life. Taught from a parent’s point of view and rated “Excellent” by past attendees. I’m confident that you will feel it’s some of the best money and time you have invested in your family. Small babies and non crawlers are welcome, so please feel free to bring them with you. Delivered by a fully qualified instructor/assessor. This has to be the most important thing on any parents tick list, when learning life-saving skills. As parents first aid is not governed (that means anyone can teach it) at Bumps & Bashes I feel teaching the correct and most up-to-date procedures is top priority. Adult CPR, Choking & recovery (Emergency Life-Support) is part of the course. It’s important learning for your little ones, but you will go away knowing the most important of first aid skills for every member of your family. 100% refund if you don’t think this is some of the best money you spend on your family. It’s the Bumps & Bashes Guarantee. In just a morning, afternoon or evening Bumps and Bashes first aid classes ensure that you’ll get the vital skills which could save your child’s life. First aid is not expensive, but it is priceless if needed and I help you understand and make it easy for you to remember, should you ever need it in an emergency. Children & Baby First Aid Course covers Emergency First Aid for all your family, from birth upwards. Ideal for Parents, Carers, Guardians & Grandparents. The manikins play a big part and I’ll bring a least 9 manikins, so no waiting around to practise. You will take away, not only the knowledge and confidence, but a full colour paediatric first aid book to complement the course, a memory jogger and some very useful hand-outs. You will be welcome to attend a FREE refresher course after a couple of years, not only to boost your confidence, but will be appropriate to the age of your children. Learning to drive takes around 50 hours, learning to save a life takes only 3! First aid if needed, is priceless.